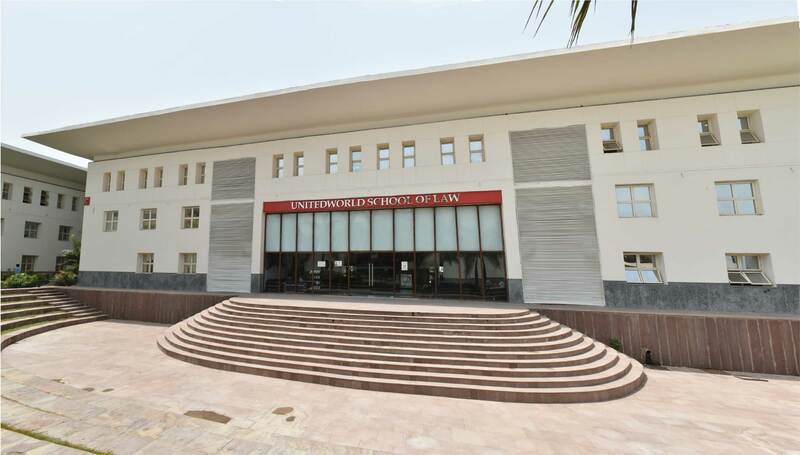 Unitedworld School of Law is a new statutory institute established by Unitedworld Group amidst lush green environment near Gandhinagar. The institute is recognized by the Bar Council of India and it is affiliated to Karnavati University. Prior 2017 we offered degree courses affiliated with Gujarat University (State University). The institute also functions as a nodal agency to uplift legal education in Gujarat. We firmly believe “Knowledge is power”. Our vision is to impart legal education with the aim of percolating constitutional values in the students of Law, to constantly work for the betterment of the nation through legal education and to effectively contribute and strengthen justice delivery system, making law, implementing law, interpreting law in India. We are striving to become a world-class Law School, looked upon as a reservoir of high-thinking professionals and visionaries. Create global citizens honed with open logical ideas based on human values. Maximize the intellectual social and logical potential of all the students and experience learning from world-class faculty members with impeccable track records. The institute is committed to exploring multidisciplinary approaches through its distinctive curriculum which is designed to give extensive exposure to students to domestic, international and comparative law subjects. Our multi-disciplinary learning methods have proved fruitful as our alumni are setting new milestones in their professional fields. Inculcate in the students a sense of responsibility to serve society in the legal field by developing skills with regard to advocacy, legal service, legislation, law reforms and the like. UWSL in a short span of years of its existence has attempted varied strategies to create a vibrant scholastic environment. We continue in honest reflection on what works and what does not as we strive to realize our aims and objectives.